We are working hard to improve our streets and public spaces to make them safer and more inviting, especially for people walking or riding a bike. Our works include creating better pedestrian links, installing cycleways, streetscape upgrades and greening our streets. The concept design for the South Coogee to Kingsford cycleway was on public exhibition from 30 October to 23 November 2018. Thank you to everybody who made a submission on this project. Council staff are currently reviewing all submissions received as part of the next stage of the design process. For further information and to contact Randwick City Council please visit Your Say - Randwick. A full concept drawing package of the entire route can be viewed online. The South Coogee to Kingsford route provides an east-west connection to the Kingsford light rail terminus travelling along Bundock St, Avoca St and Sturt St. The 1.9km route is proposed to include a separated cycleway, providing people with a safe, pleasant and healthy alternative to car use for neighbourhood destinations and for longer distance bicycle commuting. The project will also involve streetscape improvements such as new trees, garden beds, footpaths and pedestrian crossings to enhance the amenity of the streets along the route for everyone. The project is in partnership with NSW Roads and Maritime Services (RMS) under the Active Transport Program, an initiative to strengthen active transport – that is, walking and cycling – in key areas. In particular, the RMS program prioritises connections within five kilometres of public transport interchanges such as the Kingsford Light Rail Terminus. 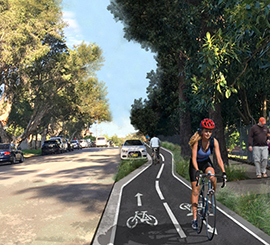 The concept design for the South Coogee to Kingsford cycleway is now on public exhibition for community feedback until Friday 23 November 2018. For further information and to contact Randwick City Council please visit, Your Say - Randwick. A full concept drawing package of the entire route can be viewed online. A map of the proposed route is shown below. 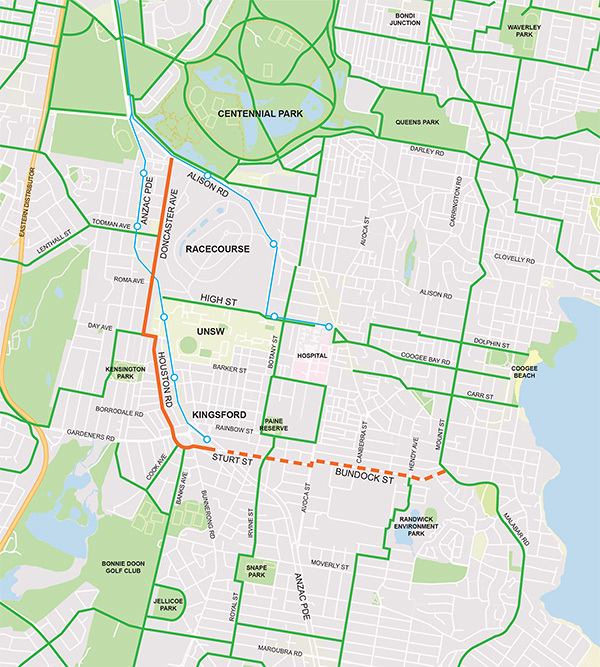 This route will provide a south-north connection from Kingsford to the city travelling through Dacey Gardens along Houston Rd, Day Ave and Doncaster Ave to connect with existing pedestrian and cycleways at Centennial Park. The 2.6km route is proposed to include a separated cycleway, providing people with a safe, pleasant and healthy alternative to car use for neighbourhood destinations and for longer distance bicycle commuting. The project will also involve streetscape improvements such as new garden beds and shrubs to enhance the amenity of the streets along the route for everyone. The concept design was on public exhibition for community feedback from 25 May to 9 am 2 July 2018. During this time you could view the concept plans and provide your input at Your Say Randwick. Printed copies of the plans were also on display at Council’s Administration building (30 Frances Street, Randwick) and Randwick City libraries. A report (starting on page 137) summarising community feedback was discussed at the Ordinary Council meeting on the 28 August 2018. View the minutes (page 10). In 2015, Randwick City Council undertook community consultation to review our bicycle routes, and to establish priorities for constructing bicycle routes within the City. 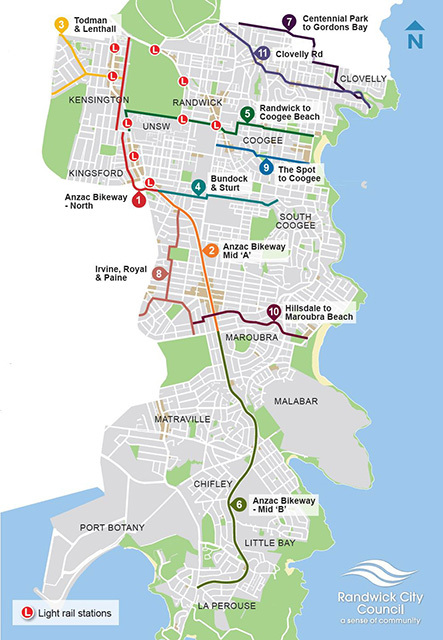 The connection from Centennial Park to Kingsford, and from Kingsford to South Coogee were both identified as high priority routes in the finalised Council network. If you’re interested in the Walking and Cycling Streetscape Improvements, please consider registering your details so we can keep you informed as they develop.